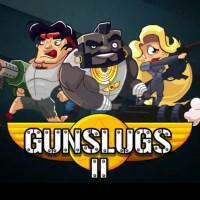 A procedurally-generated 2D pixel-art run-and-gun shooter very much like its predecessor. Run to the right, pick up weapon powerups and shoot enemy soldiers, use crates for cover and try not to take too much damage yourself. Blow up a few enemy beacons and get to the chopper to clear the stage and fight a boss at the end of every set of stages before moving on to the next level with a different setting and tougher foes. As before, the simple mechanics and light story keep things accessible, but many parts of the game design are pushed further to extremes. Enemy bullets are easier to see and your character visibly complains when they get hit, but the action overall is less readable because the screen is crowded with faster and more aggressive enemies alongside more environmental hazards. It’s harder to avoid taking damage, but enemies also drop more health packs to make up for it. Beacons are now mini-levels with their own enemies and hazards set up to make it almost impossible to avoid damage, but they also each have an imprisoned ally to rescue who comes with a full heal and a weapon swap. The game is thus more bombastic and dramatic, with more theoretically-exciting things happening all the time. However, it feels a lot less under the player’s control. Damage you can’t avoid and free health packs isn’t more exhilarating just because it makes your health bar swing more wildly. It deflates the tension of trying to play well and the satisfaction of doing so and makes it feel like the game is happening to you. As a result, despite the higher level of polish on offer I found this game much harder to get into than the original Gunslugs . Maybe someone who had thoroughly mastered that one could then take Gunslugs 2 ’s busy screens as another step up in challenge - but the constant stream of health packs would undermine that experience. I Stopped Playing When: I lost interest after playing a few levels without feeling like there were meaningful opportunities to improve.